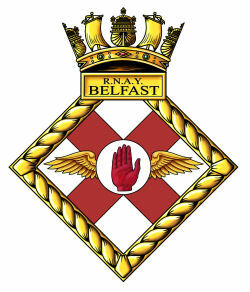 Transferred to Admiralty control June 1943. 21 June 1943 as H.M.S. 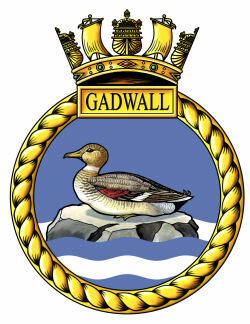 GADWALL, accounts 'on Books of CAROLINE'. Independent command bearing own accounts from 01 October 1944. Became civilian manned facility from 1959. 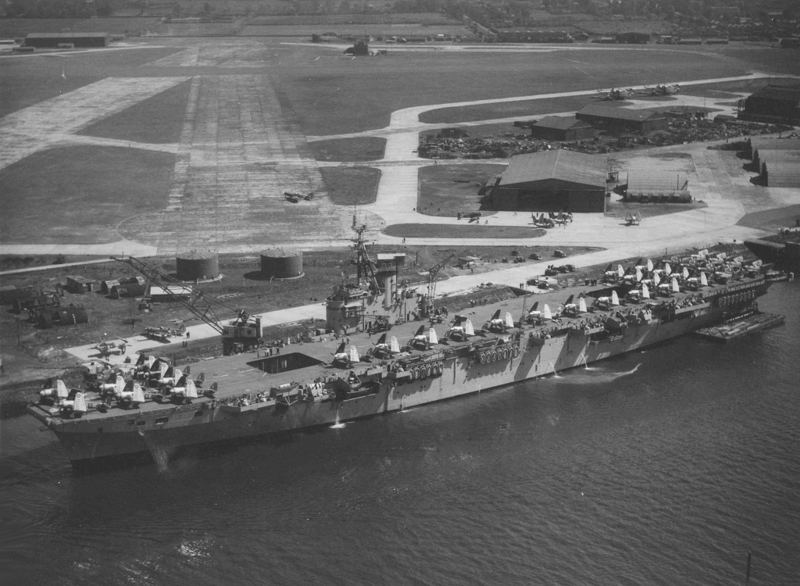 31 May 1959 (GANNET III). 02 July 1973 returned to R.A.F. control. Facilities for the embarkation and disembarkation of aircraft. 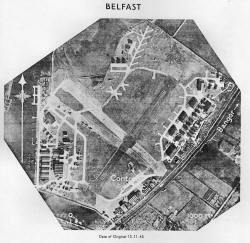 The airfield is built on a level expanse of land forming the E. side of Belfast Docks between the coastal railway and the sea wall. Sydenham railway station adjoins its SE. corner. 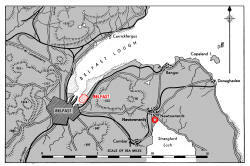 Belfast Lough, with the harbour and city of Belfast art its head. 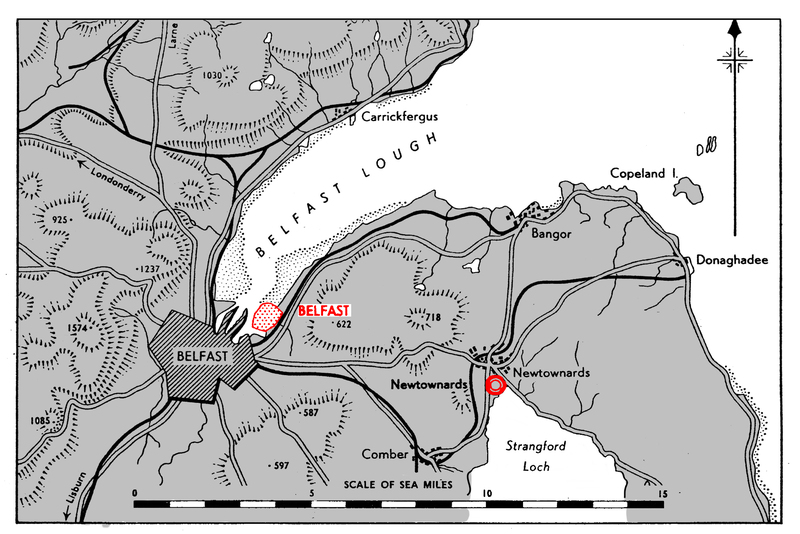 Direct road and railway communications with Belfast. Control Building on SE. side of airfield, inside perimeter track near 42 end of runway 14/32. A.T.C. civilian manned 9730 - sunset daily. Mountain range with summit 1.574 ft, distant 5 miles W.
Land rising to over 600 ft. within 1½ miles E.
Land rising to over 200 ft. within 2.000 yds.s E.
Electricity Gris pylons 1,000 yds. from SW. end of runway 05/23. Railway 59 yds. from SE end of runway 14/32. Two windsock, one NW, side and one near Control building. None. but M/F. post war. 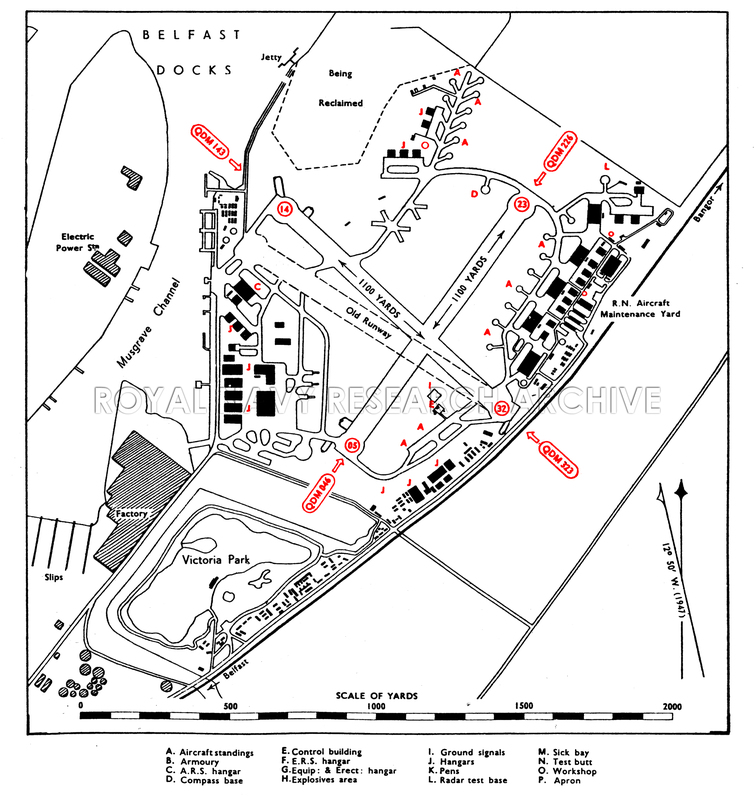 Living quarters at S. corner of the airfield and in Victoria Park, adjacent SW.
To accommodate approx 1½ squadrons. One, in A.M.Y., diameter 70'. 8 A/C standings off perimeter track on E. side and 9 on N. side. 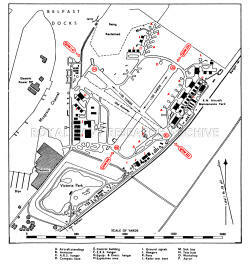 Hangars in four main sites - Squadron on SW. side, Storage on NE and SW. side, Receipt & Despatch on W. side, and Class B repair yard on E. Side. temporary hangers used to aircraft assembly at the disembarkation site. Sick Bay on S. side of airfield, near hangars. Meteorological office in the Control building. Fill meteorological service by Naval personnel available. Storage for 4,000 gallons. All grades available. M.G. range on SE. side of airfield. Visitors parking area behind Control Building. No known. Practice stocks to provision 2 T.B.R. and 1 F.R. squadron to be held. Disembarked from H.M.S. ACTIVITY 30.07.43. Embarked in MAC ship MV RAPANA 02.08.43. 4877/44 R.N. 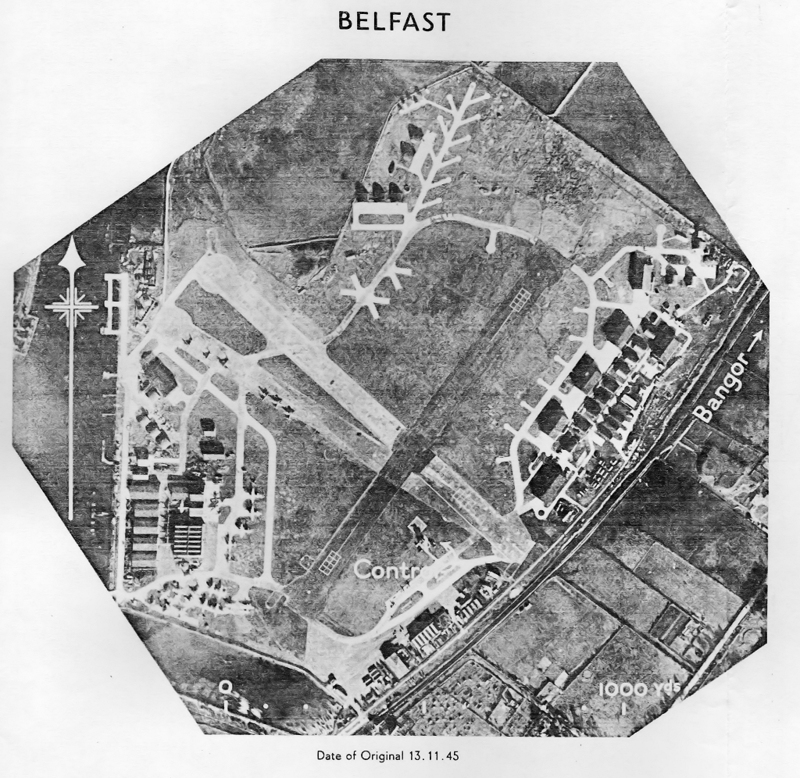 Air Station, Belfast - Accounting Arrangements. RCN Sea Furies being loaded aboard HMCS Magnificent 24 May 1948.